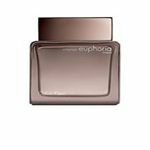 A fragrance enchanting, deep and complex that embodies the facet more sensual and mysterious of the man euphoria men. Notes Cocktail of Pepper and of Ginger, rainwater Agreement, frosted Sudachi, Leaves of Cedar, Sage, Black Basil, Drinks Ood, Vétiver, Myrrhe, Labdanum, bewitching Patchouli, and solid Amber. I bought this for my hubby...he said he likes it, since it stays for long....which is not the case with the rest of the men's perfume. This is what makes a man smell good..
One of my favorite CK fragrances. Great smell keeps me feeling fresh all day. This one draws compliments.